If you missed week 1, you can find it here. 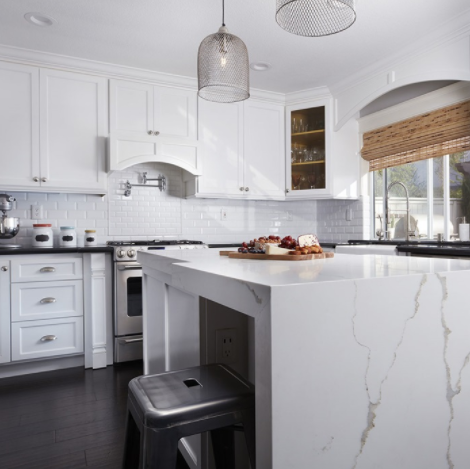 This week I am going to talk countertops...and specifically, the challenge of getting what you want (or close to what you want) when you don't have the budget for it. But to catch you up first, I am embarking on a budget-friendly redo of my powder bathroom after living with it in it's boring builder-grade state for the past almost-five years that we have lived in Hydeaway Cottage. I will not offend your eyes with the before photos again in this post. If you simply must see them, I invite you to read the previous post, BUT I must warn you. They are not pretty. Ha ha! So to prettify the bathroom, I came up with a grand plan. And in that plan there were two things that I absolutely wanted to include. A mural wallpaper with a grisaille feel to it. Check. (Again see previous post for details) And a marble countertop. That part wasn't going to be as easy as I hoped, for two reasons. Reason #2 Marble is expensive. And I am on a budget. So what's a marble loving girl to do? Bella Statuario from Della Terra Quartz. Just look at that veining. Drool. But there was another problem. This particular quartz has been discontinued. I was just hitting roadblocks left and right and I was very discouraged. Well...I put my design super-powers to work and hit on the idea of going to a stone countertop fabricator and checking out their boneyard (And what is a boneyard you ask? It is the remnant pieces of stone that the fabricator has leftover from other jobs - you can often get small countertops fabricated from these pieces for a discount). I truly did not expect to find Bella Statuario there, but the quartz gods must have been smiling on me that day because lo and behold there was one. single. partial. slab. in the boneyard. 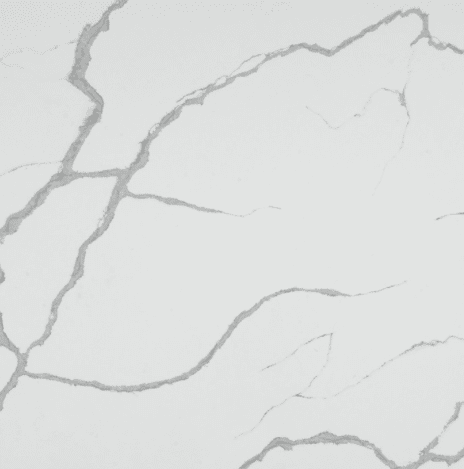 The image above is actually of Nouveau Calacatta which is similar to Bella Statuario but has warmer tones in the veining. (And lest you get excited - it has also been discontinued). But it gives a good idea of how the product looks when installed. The counter went in yesterday and I am smitten. But I am keeping those images secret for now. Such a tease, I am. So my countertop conundrum is solved and I am on to the next dilemma....paint. Can't wait to dive into that with you for next week's post. Join me on social media for more design and lifestyle fun! Oh I love marble as well! I can't wait to see which piece you chose! So glad to be tackling our kitchens together for this ORC! I love Marble too..BUT our house has so much of it...umm...I would go for quatrz next time. Your countertops will be beautiful!